Established in 2004 Mastapod Skip Bins & Rubbish Removal have been providing home owners, builders, tradesmen, shops, offices and factories with a reliable, cost efficient Skip Bin / Bin Hire service throughout Campbelltown, Camden, Liverpool, Parramatta, Penrith & Wetherill Park. Their fleet of trucks will deliver the correct size and configeration Skip Bin to your residential, commercial or industrial premises on 24 hours notice anywhere in their wide service area. For an obligation Free Quote contact Mastapod Skip Bins on (0418) 496 456 seven days a week. 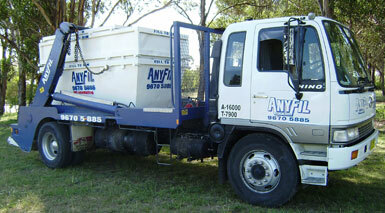 Established in 2004 Anyfil Skip Bins have been proudly serving the people of Western Sydney / Macartur with a superior, cost efficient skip bin and bin hire rubbish removal service. Areas Serviced Include: Blacktown, St Clair, Hills District, Kellyville, Windsor, Riverstone, Penrith, Liverpool, Campbelltown, Narellan and Macarthur areas. For an Obligation FREE QUOTE contact Pat or Allyn on (02)-9670-5885 or (0425)-31-00-22.